Elon's Musk Air Freshener: Air freshener shaped like the tech tycoon. Fill your car's cabin with the smell of innovation when you hang Elon's Musk on the rearview mirror. This air freshener is styled like the cartoon head of the head of Tesla, Inc. and SpaceX with a delightful musky scent to match. 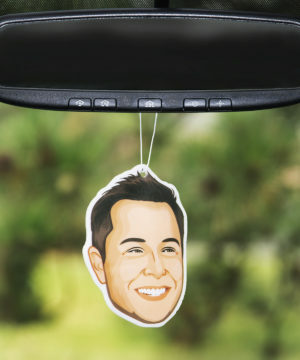 Boasting a double-sided printing of Elon's face and a punny (yet refined) scent, Elon's Musk will make your car smell like a billion bucks (even if you didn't spring for the Ludicrous Mode).